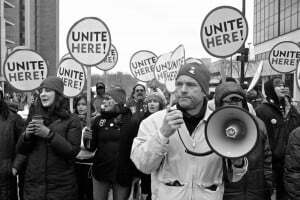 Home » Do Unions Still Have A Place In The U.S. Workforce? Do Unions Still Have A Place In The U.S. Workforce? All of these are good things, and most of them are now standard for employees – union and non-union. Unions absolutely played a major role in improving employer to employee relations, and some laws were even born as a result (such as overtime pay after 40 hours). Over the years, unions started to realize their power and started to abuse it. Whether consciously or not, they figured out that they could demand and get whatever they wanted simply by refusing to work if their demands were not met. This led to things like contracts between employers and employee unions. Having contracts that defined employment criteria, benefits and pay led to regular contract negotiations. If unions didn’t like their side of the deal in the negotiation, they would threaten to strike. The employer would have little choice but to meet their demands because they couldn’t afford to have all of their workers not working. Eventually, union jobs became premium jobs in the workforce. Workers who were part of a union earned far more than their non-union counterparts who did similar or exactly the same work. Union workers typically received better benefits and had unprecedented job security (meaning it was nearly impossible to terminate employment for any reason). What do you think happens to the motivation of an employee who knows they can’t be fired because they are protected by their union? You guessed it. Production and performance go down while pay and benefits continue to go up. There are exceptions, of course, but in a nutshell this has been the typical result of unionization. Public unions are unions for workers who are paid by governments. Teachers unions are a good example. When their demands increase, they are met by the government. Who funds the government? We all do, through taxation. When public union demands go up, it is we the people who end up paying for their increase. Here is a recent example of the teachers union in Chicago going on strike to start the 2012 school year because their demands are not being met. While the cash-strapped Chicago Public Schools have offered a 16-percent raise over four years to its striking union, the Chicago Teacher Union has requested a 35-percent pay hike and a guaranteed call-back of any educator who was laid off. Members of the Chicago Teachers Union – the AFT’s oldest local – walked off the job Monday for the first time in 25 years over issues that include pay raises, classroom conditions, job security and teacher evaluations. They are pitted against Emanuel, who wants to extract more concessions from teachers while the school district faces a nearly $700 million deficit. Major teacher strikes have been rare in recent years, compared with the 1960s and 1970s, when teachers went on strike frequently for better pay and improved bargaining rights. 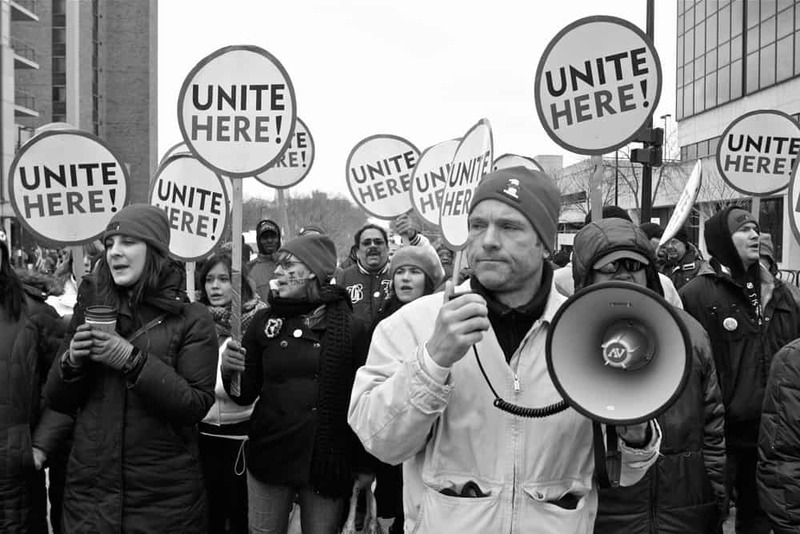 While unions generally got what they wanted in the past, they face a tougher climate today. Private unions are unions for workers who are paid by private companies. The United Auto Workers (UAW) is a good example. When their demands increase, they need to be met by the company who employs them. Who funds the company? Consumers. When private union demands go up, we the people – the consumers who buy their products, end up paying through price increases. Here is a recent example of the NFL referees union going on strike to start the 2012 NFL season because their demands are not being met. …NFL Commissioner Roger Goodell and NFLRA negotiator Jeff Triplette hammered out the particulars of a deal last Thursday and Friday that would give the officials an additional $1 million per year…. The NFLRA seeks both to retain the current defined benefit pension plan for the current staff for at least another 5-6 years, and to increase the amount of the defined benefit. We have proposed to freeze the defined benefit plan (preserving all vested benefits for all officials) and replace it with a defined contribution/401(k) arrangement – the same arrangement that is in place for all other league employees and which 13 clubs have adopted. We have offered a defined contribution that would average $20,000 per year, while the officials’ union has proposed a substantially higher amount. I never could quite understand or get with the union mentality. They call it “collective bargaining,” when they collectively group themselves together to “bargain” with their employers over pay, benefits and other employment aspects. To me, if you have to collectively bargain, that just means that you can’t bargain for yourself. Seems like a cop-out to me. And this whole idea of going on strike if you don’t get what you want. That is nothing more than a cry-baby attitude. This is something a toddler does. Throw a temper tantrum and refuse to do what they are supposed to until their every wish and demand is met. Next time you see adults on strike, marching and yelling on the street in front of their employer, think about that toddler who doesn’t get what they want. Grow up! Union members are proud of their “right” to collectively bargain. I say we all have the right to bargain and we all have the right to not work. If you don’t like what your employer is offering and they refuse to meet your demands, then quit! Go work for somebody else. Or better yet, start your own business. Create your own income. Who knows, your business could grow into something big. You may end up having to hire people to work for you. How would you like it if one day your employees decided to form a union and demand increases from you? I agree that unions were a good thing in the past. They did provide workers with many benefits and levels of safety that businesses were lacking. But now we have laws that protect workers and benefits are fairly standardized. Now, I just don’t see the point of unions. I look at it this way: there is no point for me to work hard to get ahead. No matter how hard I work, I’m going to benefit. Maybe that is the reason why so many feel as though they cannot get ahead in life. They are accustomed to just doing enough to keep their job and let the union take care of the rest. They don’t know how to work hard for promotions and raises. I know I am generalizing here, but I think it holds true for some. Agreed Don. As a trucker, I’ve gone into many companies over the years. You can tell which shops are unionized right away, as their mentality is evident and obvious right away. “That’s not my job,” is a common phrase you’ll hear from union workers. I’ve also seen unions take down a few major trucking companies in the past decade. They just couldn’t afford to keep paying high wages and good benefits, all the while paying retirees their excellent pensions.